Notes: Blackberry Blossom rearranged to the 6/8 jig rhythm. Bare bones version, strictly following the original melody - usually one of four notes is omitted (I hope I've made the right choices). Just look at the sheet music. The selection of the last D note (low or high) depends on whether you are returning to the same section or continuing to the next one. Notes: Thanks to Will Vermeer for transcribing my playing. Notes: The tenor banjo is tuned to open G tuning DGdg, there is capo on the 2nd fret. The first part (in the concert key of E) is played in D (chords D=0202, G=0000, A=2222), the second part (in the concert key of A) is played in G (chords G=0000, C=5520, D=0202). 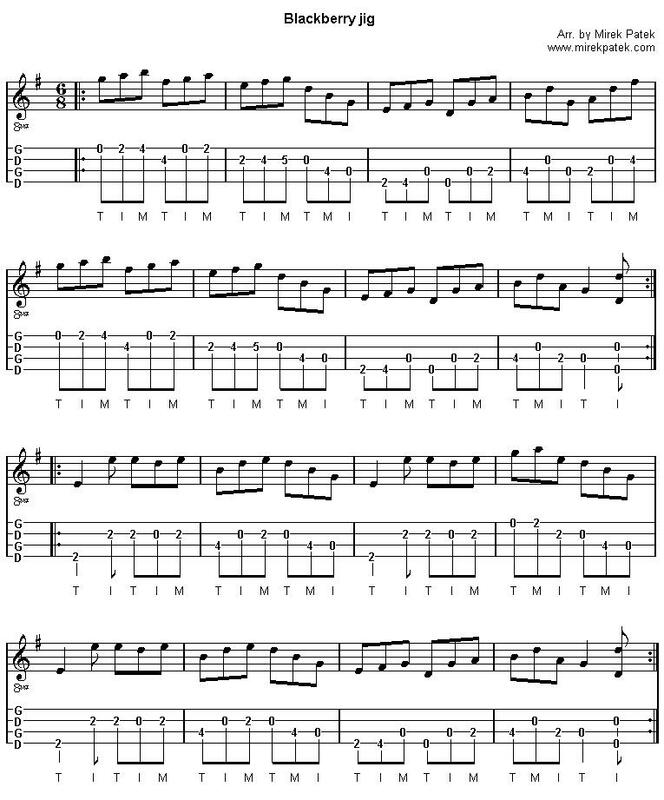 Feel free to change the rolls, as well as the filll-in licks/walking bass connecting parts (anyway, the vocal version has shorter connection between the words in the first part - adjust the number of walking bass measures by yourself). This is just one of possible versions how to play the melody in the first part and how to roll the harmony in the second part. The third part (also in the concert key of A, played thanks to capo in G) is missing but you are supposed to play some fill-in lick under the fiddle or harmonica solo - find them e.g. at http://banjosessions.com/?p=109 . 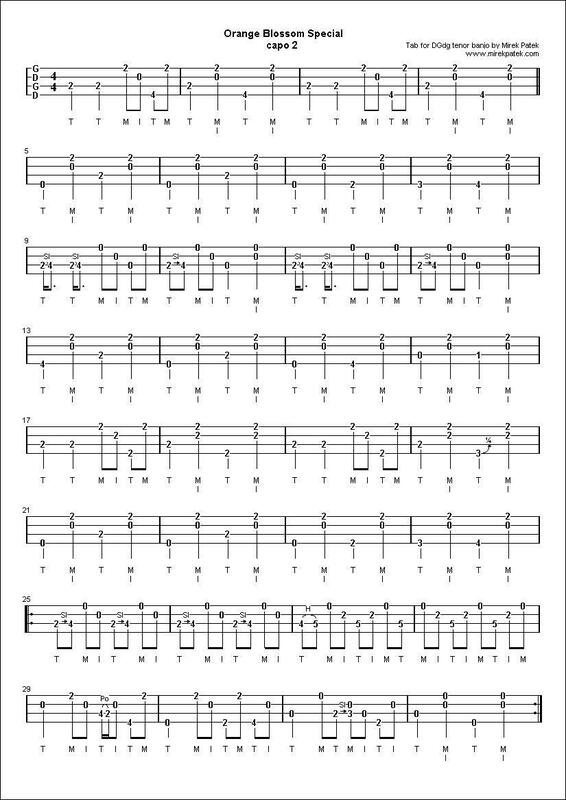 The melody over the dominant A chord (concert B chord) in the first part is compromised - however if you have big hands, you can reach the actual melody note on the 6th fret (counted with capo) with your pinky while holding the barre with your index finger on the 2nd fret. Notes: Pentatonic scales in "melodic/Keith style" on DGdg tenor banjo.